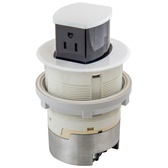 New to Pop Up Outlets, the Hubbell RCT200ALU, Surface Mounted, Spill Test Compliant, Countertop Pop Up Power Receptacle. 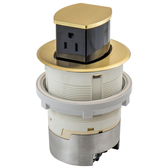 This low profile hidden power receptacle provides you the perfect power source for kitchens, islands, or bathroom counters. 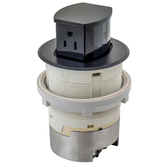 The RCT200ALU is a part of Hubbell's surface mounted power solutions and offers two 15A 125V Tamper Resistant receptacles that are rated for 20A circuits. Hubbell has designed these units with a unique compact design to save you under cabinet space, thus removing the need to alter or take out under counter shelves or cabinet space. Providing elegance in a compact design is what makes these units truly unique. Not only do they provide one of the lowest under counter profiles on the market (3.52" under counter depth), they also provide a very low profile on the countertop surface itself, with only a 3.5" diameter circular hole required to drop the unit in place. To continue with the low profile theme, when these units are full "Popped Up" they are less than 2" in height. The Hubbell series of Pop Up Outlets are extremely easy to use and operate. To open the device, simply press the top of the unit and it will naturally rise out of the counter surface on its own. You will then have access to the two receptacles for charging phones, laptops, or tablets. You may also notice one outlet is upside down, this is to allow you to plug in larger style plugs commonly used in kitchen appliances, like mixers, blenders, and other heavy duty kitchen tools. When finished simply unplug all your devices and gently push the outlet back down into the housing, until it clicks into place. This unit comes in a stylish brushed aluminum finish, however if that does not match your kitchen color design, these units are available in 7 different finishes total. There are two mounting styles; flush mount, so it is smoothly installed with your counter top, and surface mounted, which is slightly elevated above the counter. The tops of these units are also interchangeable in the event they get damaged or you would prefer a different color. One of the biggest accidents to occur in kitchens can be spills and splashes. Knowing that these accidents will occur, Hubbell has test and designed these pop up outlets to be water resistant to up to a half gallon spill! To make this happen these units features a unique silicone gasket that seals and protects the outlets and inner mechanics from water entering the device when in the open or closed position. To further protect the device, each 15A receptacle are water rater and tamper resistant to meet code. These units are UL498 Section 146 Listed which means they have been built and listed to be water resistant to a half gallon of liquid spilled on the device. In addition they meet NEC 406.5(E) code for Receptacle assemblies for installation in countertop surfaces are listed for countertop applications. 1) Cut a circular hole approximately 3.5" in diameter in the countertop for surface mount installation. If installing a flush mounted trim, an additional counterbore cut is necessary: .09" deep with a 4" in diameter. 2) Remove the base from the housing to expose screw terminals. make sure the circuit is OFF. 3) Feed cable through the lock nut under the countertop, as this will secure the device later. 4) Fasten the metal jacket to the device base. A fitting will be required (not included). 5) Strip conductors to the correct length as shown on the device. Ground the base by bonding the green or bare wire to the grounding screw on the base. Terminate the green or bare wire to the green screw marked. Terminate the white or gray wire to the white screw marked “WHITE” and black or red wire to the brass screw marked “HOT”. 6)Reattach the base to the housing and secure with screws. 7) Insert the device into the countertop opening and hand tighten the lock nut to secure the device in place. 8) Terminate the device to the power source. Press the cover to pop up the receptacle to use, press again to close. Height when popped up: 1.69"
Works in counter thickness: .56" - 2.13"